Well, on Thursday I went to the place mentioned in the title and posted two blogs about my journey. I know, I know, WP recommends regular blogging habits for a success it has yet to define and my irregularity has become the most notable thing about my blogging life. But hey, life is too short to obey rules for a success I don’t even begin to understand. If you want the details, read the last two posts. If you do, you’ll learn I had an unexpected delay and so time to kill at Thorpe-le-Soken where I had anticipated a dash across the platform to get the connecting train. Admittedly I had imagined a bigger platform. Waterloo it ain’t. Walton-on-the-Naze is by the sea, just up the coast from Frinton where, if memory serves, I spent at least one holiday as a small child with my parents, sister, great aunt, her daughter and grand daughter Alison. Under Alison’s supervision we dug man traps on the beach but I don’t think we caught anyone. Alison is now a successful (not a WP definition) artist based at Southwold. Frinton’s station platform was colourful. My cousin Helen sent me this fabulous photo of Aunt Kath as a teenager enjoying herself in the sea. Kath was always beautiful from childhood onwards. I don’t think she lacked male attention, but once widowed while still young she had no desire, at least to my knowledge, to remarry. I have the barest memory of her husband. He was on the periphery of my vision, while she was centre stage. It was blowy by the sea and the horizon was all sky. Gorgeous. And cold. The others had been looking forward to fish and chips on the prom, but the friers were cold today. Vernon and Charlie made a beeline for the amusement arcade. It’s decades since I have been in one, but 80p went a long way and I was glad to discover my oh yeah instincts outweighed my gambling ones by about a hundred to one. I might yet be safe on a trip to Vegas. I left with some two pence pieces still safe in my pocket. We lunched in a Wetherspoon’s called the Joseph Conrad since Lowestoft is apparently where he arrived in Britain from Russia. Lowestoft was at that time a thriving, bustling port. Now it is a run down town with the air of somewhere that has seen much better days, and which has not quite given up hope, despite evidence to the contrary, of a renewal of those fortunes. 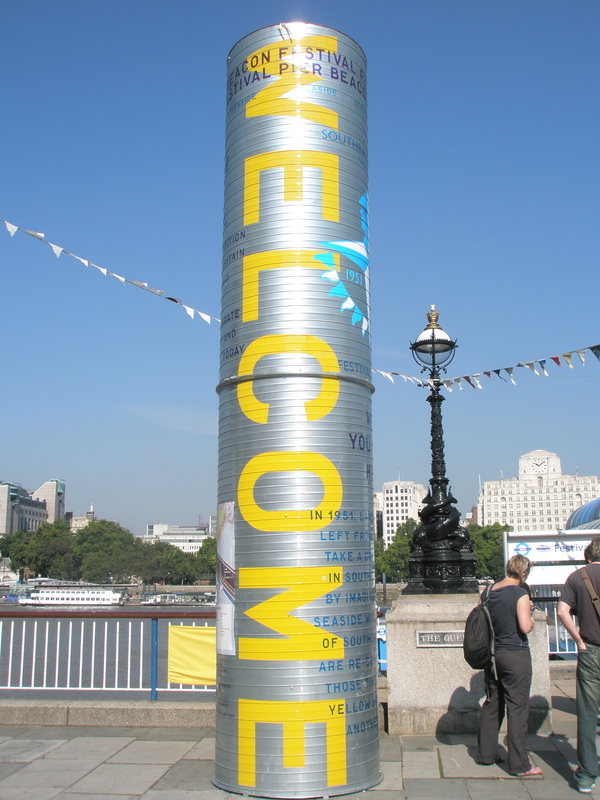 The famous bends of London’s river mean that at a point where you are actually on the east bank of the Thames, you’ll find the South Bank. Not that it seems to worry anyone. Geographically inexact, the South Bank Arts Complex and river side walk, is a brilliant, yet undersung, part of the capital, whatever the compass point or season. Here, sixty years ago people gathered for the Festival of Britain; a concerted effort to cheer a population who had endured the dark days of the Second World War, and the austerity that followed. My parents went. Married three years and pretty penniless. I imagine my mother, in the first weeks of pregnancy, strolling wide-eyed, seeing a glimpse of this future world where her child, my older sister, would grow up. Today, even in recession, people on the South Bank look look well fed and well dressed. They are enjoying a festival to remember that festival of 1951, which was itself a conscious echo of the Great Exhibition of 1851, an event that spawned Expos around the globe. I had a meeting on the South Bank the other morning. Arriving early, I took the opportunity to use my camera. 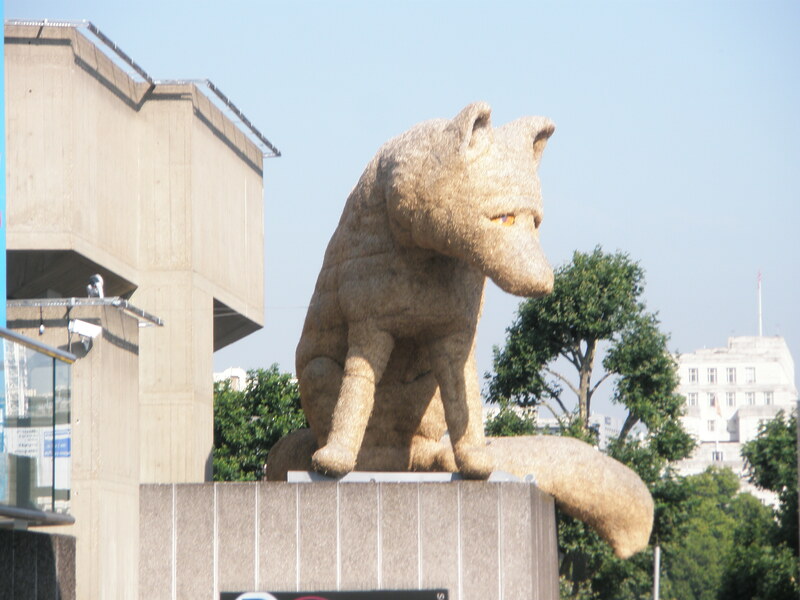 I’ve been admiring the Urban Fox sculpture for weeks, every time I’ve crossed Waterloo Bridge on the bus.